President Cyril Ramaphosa has proclaimed the establishment of an Investigating Directorate in the Office of the National Director of Public Prosecutions, under Section 7(1) of the National Prosecuting Authority Act, 1998 (Act No.32 of 1998), to address allegations emerging from the commissions of inquiry and corruption-related crimes. The new directorate was recommended by the Ministry of Justice and Correctional Services, Police and the National Director of Public Prosecutions. The new directorate will investigate Common Law offences including fraud, forgery, uttering, theft and any offence involving dishonesty. It will also investigate statutory offences including contraventions of The Prevention and Combating of Corrupt Activities Act 6 of 2000; The Prevention of Organised Crime Act 121 of 1988; The Protection of Constitutional Democracy against Terrorist and Related Activities Act 33 of 2004; The Public Finance Management Act 1 of 1999; The Municipal Management Act 56 of 2003; The Financial Intelligence Centre Act 38 of 2001; and statutory offences involving dishonesty. The Commission of Inquiry into State Capture on allegations of corruption and fraud in the public sector which was publicised under the presidential proclamation no.3 in the Government Gazette no. 41979 of 17 October 2018. The Commission of Inquiry into Tax Administration and Governance by the South African Revenue Service (SARS) publicised under the presidential proclamation no. 17 of 2018 published in the Government Gazette no. 41562 of 24 May 2018. The Commission of Inquiry into Impropriety in the Public Investment Corporation publicised under the presidential proclamation no. 30 of 2018, published in the Government Gazette no. 41979 of 17 October 2018. Any other serious, high profile or complex corruption case referred to the new directorate by the National Director according to Section 28(1) (b) of the NPA Act. Ramaphosa said in a statement that the new commission is part of the government’s intensified campaign against corruption and state capture. 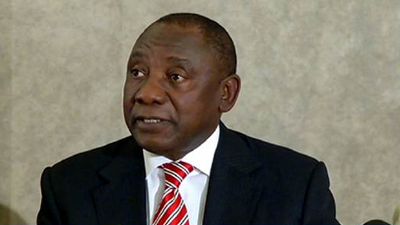 The post Ramaphosa proclaims establishment of NDPP Investigating Directorate appeared first on SABC News – Breaking news, special reports, world, business, sport coverage of all South African current events. Africa's news leader..